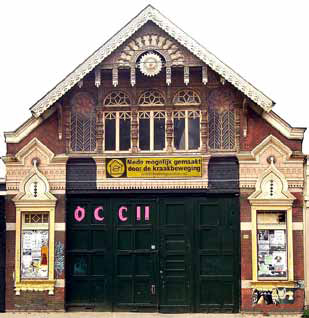 Visitors of OCCII often ask about the story behind the venue’s decorated facade. The general story we always believed was that the front of the building was an example of “folly architecture,” which basically meant that it was made to look bizarre without a purpose. 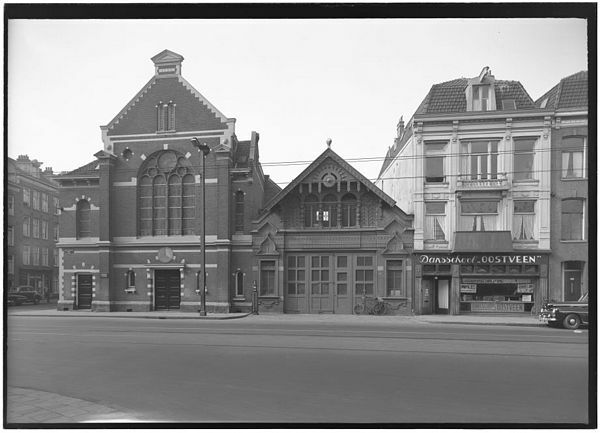 In the late 18th century it was fashionable to build follies, and on the Amstelveenseweg there were more examples, which have now all been demolished. 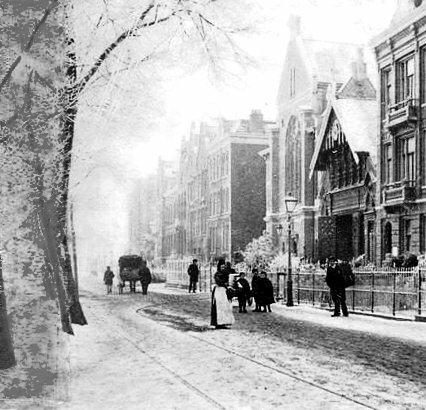 The story goes that this ornate architecture was to please the “rich kids” of the day who where parading around the Vondelpark and chic south Amsterdam with their horse and carriages on Sundays. Last year I stumbled upon a book on architecture by a local historian, Arjen Looyenga, which had an interesting chapter about “the old horse tram coach house on the Amstelveensweg.” The chapter explained that the two architects of the building, father and son Salm, were building more horse tram coach houses in Amsterdam because of their connections with one of the founders of the Amsterdam Omnibus Society (which exploited the horse trams). This guy was also the director of the Artis zoo, where Salm and son built the aquarium and library. Their architectural style was ecclectic, meaning that they picked and chose their inspiration from different traditions and countries. 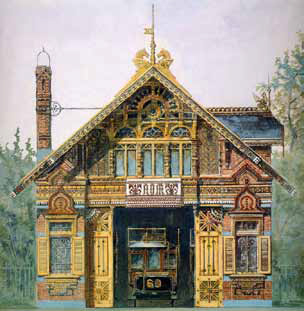 Father and son Salm also had good connections with Russia, which later turned out to be the biggest influence on the look of the horse tram coach house which was built in 1883-1884. The Salms’ earlier buildings were noticed by some rich Russian folks, which resulted in several orders from Russia. Around that time the Russian traditional style of building from the 16th century was very popular with the Russian nationalist avant-garde. 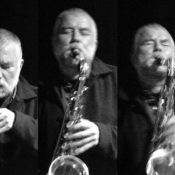 This style was also propagated by Viktor Hartmann, a Russian painter and architect. 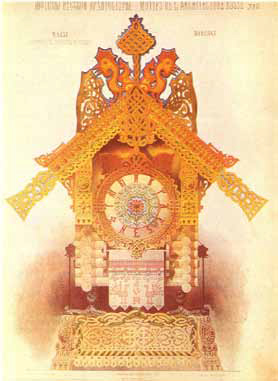 One of Hartmann’s creations was a design for a clock based on a popular folk legend: a story about Baba Yaga, a witch who lured people into her “hut on chicken legs” to eat them. 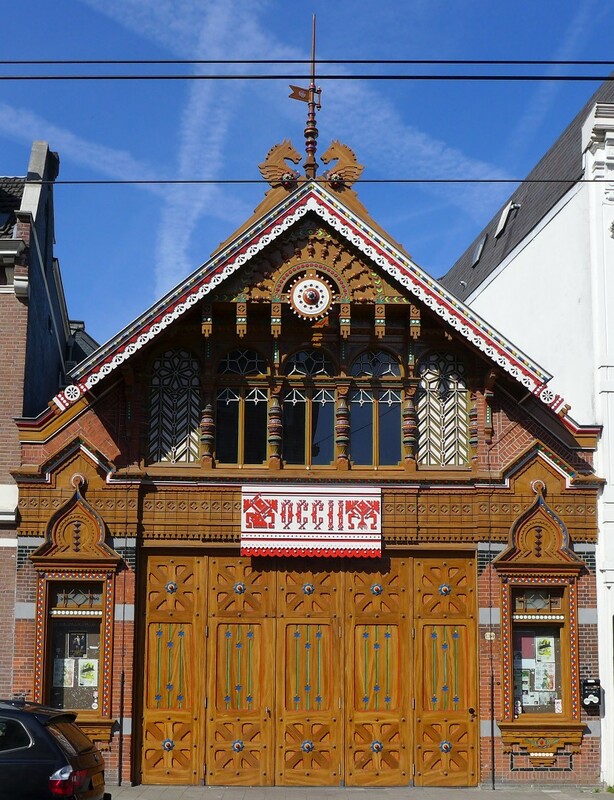 If you take a look at the design of the clock (see picture) you can tell where the Salms got their inspiration from for modelling the facade of the OCCII building, swapping the chicken heads from the clock for those of horse heads on the roof. 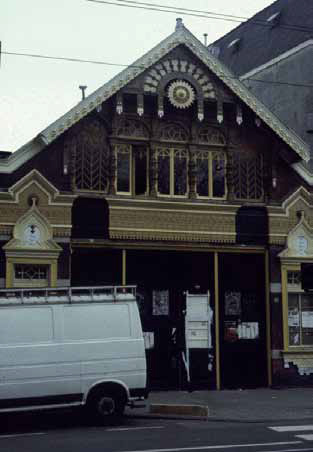 Arjen Looyenga wrote his chapter on the old horse tram coach house in 1998 expressing his hope that this unique building with so many associations would be restored to its original glory. Unfortunately Looyenga passed away in 2007, three years before OCCII volunteers renovated the building and restoring much of its original façade in 2010. Thanks to Looyenga and his book for bringing us this story!